Did you know that an American suffers from a heart attack once every two minutes? Today, less than 1/3 of these victims receive bystander CPR assistance. 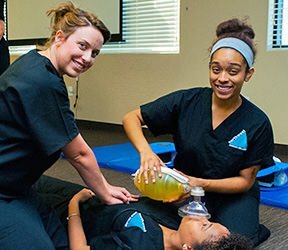 Northwest Career College is an American Heart Association (AHA) testing center and is working with the AHA to improve that CPR Classes Las Vegas statistic, one bystander and one victim at a time, by providing affordable, quality CPR Classes to the Las Vegas community. Four out of five heart attacks happen at home. Statistically speaking, the life you save is likely to be someone at home: a child, a spouse, a parent or a friend. African-Americans are almost twice as likely to experience a heart attack at home, work or in another public location, and their survival rates are twice as poor as for Caucasians. CPR provided immediately after a sudden heart attack can double or triple a victim’s chance of survival. Only 32% of heart attack victims get CPR from a bystander. Sadly, less than 8% of people who suffer a heart attack outside the hospital survive. annually in CPR in order to teach them the skills to perform bystander CPR. Northwest provides a Certified AHA CPR Trainer for every class given. For How Long Is My CPR Card Good? Your certification will be valid for up to two years. Will I Be Notified When It’s Time To Recertify? You’ll be automatically placed on our call and email lists to remind you of your re-certification date. If you already know you are going to take a CPR class, don’t wait another minute! Contact Northwest Career College in Las Vegas at cpr@northwestcareercollege.edu or call us at (702) 254-7577 to schedule your class now! We are confident we’ll be able to set you up with Las Vegas CPR Classes that fits your personal and professional needs and schedule. CPR classes are not accredited by ABHES. For those who took the online, written CPR class through the American Heart Association website and only need to complete your hands-on, skills check, Northwest offers classes on campus for BLS for Healthcare Provider or Heartsaver for $20. To register for this by appointment only class, please click here. What Are You Waiting for? Get CPR Certified Today!